The name Bangers, lends itself to many types of automobiles, Big Vans, Figure of 8, team racing and even caravans all get a chance, whilst the lower engine capacity limits on a number of the meetings throughout the season give the chance for the smaller fry to perform without getting their prize blitzed by the big stuff! The biggest night of the year goes to Foxhall Stadium, where the traditional Banger World Final takes place at the Ipswich venue in October. 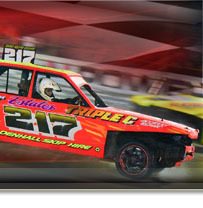 2019 also sees the continuation of the popular National Banger World Series with 7 top quality rounds of full contact racing at some of our tracks and those of our sister companies, Incarace & Mildenhall Stadium - the prize at each round for one lucky driver being a place on the grid for the National Banger World Final at Ipswich in October! Spedeworth / Incarace are pleased to announce the points system for the National Bangers registered to Spedeworth in 2018/19 up to the end of the 2019 season. For 2018/19 the EA & South registered points charts will remain merged together to create one qualifying chart. Saturday 19th October - Ipswich - u2000cc - 15 points (1st points meeting towards the 2019/20 World qualifying procedure). Saturday 2nd November - Ipswich - Unlimited - 15 points (2nd points meeting towards the 2019/20 World qualifying procedure). Saturday 8th December - Eastbourne - Micro Madness - 15 points (3rd points meeting towards the 2019/20 World Qualifying procedure). The top 15 Spedeworth registered drivers will qualify for the World Final.